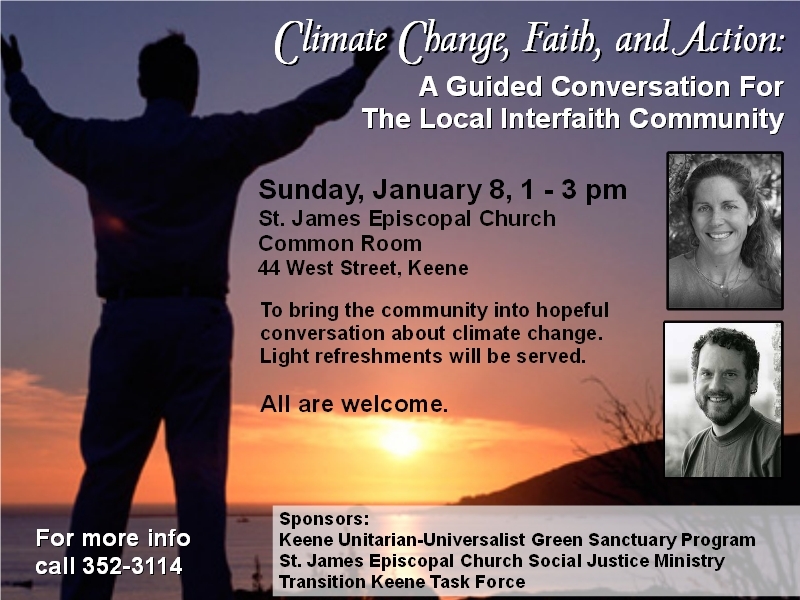 Putney Friends Meeting member Steve Chase will be co-facilitating a community interfaith conversation at St. James Episcopal Church in Keene on “Climate Change, Faith, and Action” this Sunday (January 8) from 1 to 3 pm in the church’s Common Room. This event is co-sponsored by the Transition Keene Task Force, the Keene Unitarian Universalist Church, and the St. James Episcopal Church, where Steve has given a guest sermon and led an adult education session before. Steve will be co-facilitating this event with Polly Chandler, the director of the Green MBA program at Antioch University New England and a member at St. James. The program is free and open to the public. For more information, you can call Steve Chase at 603-357-2626 or send him an email.